The most important part of any financial analysis is understanding the risks that a firm, industry, sector or economy faces. The markets are defined by "Black Swan" events where previously unknown risks emerge and overnight the markets are down 10, 20, 30% or more. 1929, 1987, Long-Term Capital Management, Barings Bank and of course 2008 and the mortgage crisis. In hindsight, all the warning signs were there, the markets simply didn't recognize them until it was too late. Because of that I always try to identify and discuss risks in my articles, and one risk I always try to highlight is the political risk embedded in the green economy. Key point to investors: As the recent Congressional hearings highlight, the political risk to the biofuels industry simply cannot be overstated. The economic dynamics can change overnight, and never provide reliable visibility beyond the next election. Congressional hearings can be called on a moment's notice, so these firms are always subject to the whims of Congress. My focus on climate change, its supporting science and the politics behind it has made me very unpopular in some circles. I've been insulted, smeared, slandered, ostracized, excluded, obstructed and routinely censored. I even had a librarian create a fuss about one of my presentations and secretly unplug my computer, which died half way through the presentation. I know that sounds paranoid and crazy and I normally wouldn't mention it except that the manager of the library sent a letter of apology. Another bizarre event got me interviewed on a local radio station. Representatives from The Ohio State University Byrd Polar Research Center showed up at a local school board meeting to block me from giving the presentation at the high school. You'll understand why later in the article. My background isn't in climate science, but it is very intensive in science, math and statistics. My educational and professional background includes the hard, social, health and biological sciences, extensive applied mathematics and statistics, optics, radiation, absorption, lighting, wave physics and most importantly, multi-variable linear regression modeling. The early climate models were nothing but edited financial models, and the principles and statistics that guide the multi-variable models used to define the stock market don't change just because they are being used to model the climate. Math is the language of science, and if you understand math, what branch of science it is applied to really doesn't matter. That is what leads me to being skeptical of the climate change "science." After extensively looking into the data, statistics and conclusions reached by the climate "scientists," I was consistently appalled by what appeared to be a complete and utter disregard for widely accepted scientific, mathematical and statistical practices and principles. I am not alone in this conclusion. Steve McIntyre, a fellow non-academic non-climate scientist, looked at the statistics and techniques used to create the peer reviewed global temperature chart used by the Intergovernmental Panel on Climate Change or IPCC in its 2001 report. His withering critique of the chart set off the "climate wars," and exposed one of the greatest scientific embarrassments in history called the "Hockey Stick Chart." Temperature data is the foundation of any climate model, and yet it took a non-peer reviewed non-academic to point out to the "experts" all their errors. That unfortunately is a true story, and why I put no value in the claims of "consensus" and "peer reviewed." Imagine the chances of the FDA approving a drug, if it was the FDA scientists finding the flaws? Imagine the chances of passing an SEC audit if it is the SEC finding the flaws in the performance calculation? Unfortunately there is no FDA or SEC in the field of climate change science. For the last 6 to 8 years I've been wondering why the Grand Ole Party (BATS:GOP) wasn't fighting back? Denying man is causing global warming is red meat to the Republican base. "Big Oil" is paying a huge regulatory cost, consumers are paying higher prices for food and energy, labor intensive "fracking" and coal are under attack, Keystone and the jobs it would create are being blocked, countless taxpayer funded wind and solar firms are going bankrupt, it appeared to be a clear political winner and yet the GOP did nothing. I would think to myself "a two year old can see the flaws in this "science," why aren't the Republicans having hearings?" I've always believed that if climate "science" was ever put on trial for all the world to see, it would be found guilty of at a minimum scientific malpractice and incompetence, and at worse willful deceit, deception and fraud. In 2013, only about one in five Republicans told Pew they thought human activity should be blamed for global warming, while nearly nine out of 10 Democrats thought the two were connected. And that disparity will likely be exacerbated as Americans increasingly tailor their media consumption to outlets that reinforce their preexisting beliefs. Having dabbled in politics however I learned that things rarely are what they seem. When things look like they don't make sense, they really do make sense, you just don't understand the method to all the madness. There is almost always a hidden agenda, ulterior motive or scheme going on. I just couldn't understand why everyone was remaining so silent on such an easy to win case. Al Gore's movie An Inconvenient Truth after all had been put on trial over in the UK, and was already proven to be highly misleading, yet the GOP seemed content to just sit back and let the Democrats have their way on this issue. Recent events however have made it clear that the GOP has been playing Opossum all along. The first clue was the handling of ethanol "blend wall." This EPA manufactured crisis was seized upon by "Big Oil" and congressional GOP members to hold hearing and the API is starting a campaign to fully repeal the EPA's RFS2 program. The climate change opposition wasted no time in pouncing on the issue. It was as if they have been waiting in the bushes for the prey to come into range. The ethanol "blend wall" was the opportunity the opposition had been waiting on to galvanize and catalyze the long overdue resistance. Hearings on the EPA and API repeal campaigns however are just the start. The GOP smells blood, and there is an election year coming up. The GOP recently announced that they will be having "mega" hearings on climate change starting on September 18th, 2013. I anticipated such an event and recently wrote an article detailing what likely will be discussed in these hearings. Investors in green economy companies should read that article to understand what is likely to come out of the hearings. In this article I tried to review some of the problems unbiased and objective people may have if this science is ever heavily scrutinized by the US Congress. Just recently we witnessed how political pressure can influence the EPA, and if the EPA is willing to bend during an extremely supportive administration, it will likely break when there is no political support. This article is not to settle the argument whether or not AGW/Climate Change exists, only to highlight some issues that may present a problem if this issue is ever given a fair hearing in Congress. Now that all this is unfolding, the GOP's tactics have become crystal clear. What the GOP has been doing by playing opossum is selling the Democrats the rope that would be used to hang them. The GOP has allowed the Democrats to become inseparable from the climate change issue, they have made the Democrats own this issue, all the while knowing that the data supporting this "science" was melting faster than an ice cube on a Solyndra solar panel. The hearing, entitled "The Obama Administration's Climate Change Policies and Activities," will touch on the science underpinning global climate change. A draft of a major United Nations report leaked to Reuters earlier this week showed that the panel of scientific experts writing the U.N.'s Intergovernmental Panel on Climate Change report is at least 95 percent certain that human activity-primarily burning of fossil fuels-is the biggest cause of global warming since the 1950s. The IPCC is the primary guide countries use when deciding how to confront climate change. "The idea is to focus it on the administration's climate-change policy; obviously science is an integral part of that," said a Republican committee aide, who added that it will be "quite a production" covering a wide array of issues related to climate change. The GOP could not have chosen a better time to hold these hearings. Temperatures have been flat for over a decade, while CO2 has continued to march higher. The IPCC made the mistake of promoting climate science as a real science and they used scientific language and produced scientific graphs. Using terms like "95%" confidence is a scientific term used to define a "confidence interval." 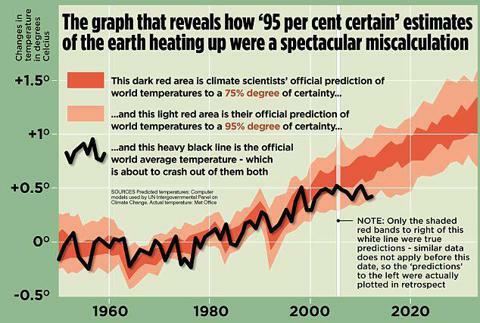 The IPCC published their forecast model of global temperatures and made the mistake of including confidence intervals. Current temperatures are about to violate the 95% confidence level on the cooling end. Violating the 95% confidence band means that you reject the null hypothesis, violating the 95% confidence level means that your model is invalid. Violating the 95% confidence level means you have some serious explaining to do, especially when the theory that was just rejected has cost the taxpayers billions if not trillions of dollars. In any real science the above chart represents "game, set, match," "checkmate," "game over," "do not pass go," "if the glove doesn't fit you must acquit." That chart alone should be enough to make anyone trying to defend this "science" have to do some smooth talking on a level that would make politicians look like boy scouts. This quote highlights the real problem climate warmists face. They have a "consensus" at the 95% confidence level that man is causing warming, yet the data is proving just the opposite. The climate warmists have a "consensus" on a failed model. Climate scientists largely agree that warming has paused over the past decade (especially in measurements of surface temperature), but they say that break is temporary, and the near-consensus on human-caused global warming remains unbroken. How can irrefutable data that runs totally contrary to the theory not change unbiased scientific minds? Data driven science follows the conclusions generated by the data. Only in climate "science" do the "scientists" simply ignore the data and stick with the theory, even when the data is rejecting the theory at the 95% confidence level. Worst yet, when they find themselves in a hole, they simply ask for a bigger shovel. The above linked article highlights how the warmists are blaming volcanic activity for the cooling. That's exactly what's happening right now, according to a study released in March. Since 2000, volcanic aerosols increased their heat-blocking ability by between 4 percent and 7 percent, according to the study from a team of researchers at NASA, the National Oceanic and Atmospheric Administration, the University of Colorado, and elsewhere. The problem with that theory is that just 5 years ago, warmists were claiming just the opposite. There's almost no question that this is going to stir up the climate-change deniers. So, before people get too excited, and claim that all this global warming is happening because we're just going through a period of low volcanic activity - read the IPCC reports. And all the other very good science on the subject. A similar contradiction is happening right now with some warmists making hysterical claims about the melting of the arctic ice cap. Apparently the climate inquisition of the NASA dark ages is over now that self defined environmental activist James Hansen has retired. In the above linked article about the polar ice caps a NASA scientist refutes the hysterical claims as nonsense by using historical data from ice cores. It's a bad day for climate science when NASA scientists are no longer intimidated into silence. If anyone knows what good science is it is NASA, and I'm pretty sure the people that put a man on the moon don't want to be associated with models that are being rejected at the 95% confidence level. NASA's credibility is on the line, and they have a lot of work to do to distance themselves from the damage Hansen has done to their reputation. Without NASA giving the climate scientists cover from scrutiny, they will no longer be able to hide behind internal whitewash investigations like those performed at Penn State and East Anglia after the climate-gate scandal broke. "The paper says that their scenario is 'likely.' I strongly disagree," said Gavin Schmidt, a climate scientist at the NASA Goddard Institute for Space Studies in New York...One line of evidence Schmidt cites comes from ice core records, which include two warm Arctic periods that occurred 8,000 and 125,000 years ago, he said. There is strong evidence that summer sea ice was reduced during these periods, and so the methane-release mechanism (reduced sea ice causes sea floor warming and hydrate melting) could have happened then, too. But there's no methane pulse in ice cores from either warm period, Schmidt said. "It might be a small thing that we can't detect, but if it was large enough to have a big climate impact, we would see it," Schmidt told LiveScience. I can't think of a more embarrassing way for the GOP members of congress to make their case than to have NASA scientists refer to ice core data to debunk the claims of the "consensus" scientists. Like the temperature chart above, the GOP will be able to use the climate "experts'" own data and research to make the case against global warming. Published data and research would likely be enough for the GOP to make their point, but the real damage will occur when they look into the climate-gate emails. While the investigations at Penn State and East Anglia found no wrongdoing, I doubt Congress will reach the same conclusion. As I mentioned above, members of The Ohio State University's Byrd Polar Research staff and leadership, as well as professors from other departments and universities found it necessary show up to a local school board meeting in order to dissuade them from allowing me to give my global warming presentation to the high school. For the last 6 to 8 years I've been giving a presentation on the science supporting global warming, and now climate change, and each time I give the presentation I would make a public challenge to debate Al Gore's "good friend Dr. Lonnie Thompson" who was featured in Al Gore's global warming documentary. The reason I do this is because the poster child of the then global warming movement is the Mt. Kilimanjaro glacier. The Mt. Kilimanjaro glacier is at 19,340 ft, 5,000 ft above the freeze line, and it never gets above freezing. I would tell the audience that I want Dr. Thompson to explain to the public how a glacier "melts" in sub-zero temperatures. I would tell them that the glacier isn't "melting" it is undergoing a process called sublimation that has absolutely nothing to do with global warming. When ice cubes disappear in your freezer it isn't because they are "melting." Instead, melt on Kilimanjaro is caused by sublimation, which turns ice directly into water vapor at below-freezing temperatures-essentially the glacier gets a giant case of moisture-sapping freezer burn. The Byrd Polar Researchers had a lot of success stopping my efforts to inform the public, but that was before the leaked emails. Sure enough my suspicions were validated as the leaked emails prove that the climate scientists believe the glaciers are undergoing sublimation and the temperature data shows that there has been no material warming in the area in question. While the climate inquisition was able to censor me, I doubt they will have such luck with congress. I am pretty sure some members of congress are aware of the climate inquisition's tactics and the leaked emails implicating sublimation and naming names. I've heard Lonnie Thompson talk about the Kilimanjaro core and he got some local temperatures - that we don't have access to, and there was little warming in them. The same situation applies for Quelccaya in Peru and also some of his Tibet sites. Lonnie thinks they are disappearing because of sublimation, but he can't pin anything down. Climate change isn't only a political issue, it is an economic and financial issue as well. CO2 driven climate change is the foundation of the EPA's RFS2 legislation and regulations. The RFS2's regulations have literally created the fuel ethanol, biodiesel, renewable fuels and cellulosic based fuels industry. Other regulations have been directed at coal burning power plants, resulting in the creation of the wind and solar industries. The important point investors need to be aware of is that these aren't market driven competitive industries, they are political constructs, and what the politicians can construct, they can also destroy. Without government support these industries simply won't exist anywhere near the size they currently are. "Big Oil" will buy 4% of their fuel capacity in ethanol because it acts as an oxygenator, but over that level they really don't have any use or want of it. Right now "Big Oil" is blending near 10% of its fuel as ethanol, triggering the "blend wall" issue. Given that "Big Oil" essentially buys 100% of the ethanol produced in the US that would imply there is 60% un-needed capacity in the ethanol industry. Right now the theoretical price for ethanol is around $2.00 (assuming anyone actually wants to use it as a fuel), and a bushel of corn goes for around $4.70, which will also produce about $2.15 in "dried distiller's grain." A bushel of corn produces about 3 gallons of ethanol, so one bushel of corn can turn a nice profit if converted to ethanol, and the "theoretical" price of ethanol above doesn't include the embedded RIN. Ethanol actually goes for around $2.44. The demand for ethanol supporting that price however is a regulated demand, and without the RFS2 mandated quota the demand would likely be cut in half or worse, and the price of ethanol would likely follow the collapse in demand. Ironically, while the "blend wall" hasn't been benefiting the producers as much as the "blenders," and the corn growers have actually seen the price of corn collapse. "We are going to harvest a record corn crop," said Dave Smoldt, a vice president for FCStone LLC in West Des Moines, Iowa, who predicts a harvest of 13.993 billion bushels. "There are high plant populations, and the cool temperatures have helped corn yields. The crop needs the warmer weather and more rain to finish strong." If corn ethanol regulations aren't supporting the price of corn, why should politically important Iowa continue to support them? The promise of ethanol riches has lead to Iowa corn growers over planting corn, but no one ever explained to them that reaching the "blend wall" was likely to drive the price of corn lower, not higher. Part of the RIN theory was that reaching the "blend wall" would drive the price of ethanol lower to make E85 fuel more affordable. The RIN mechanism did work as RIN prices did increase, but the RIN revenues are mostly going to the "blenders" and not the ethanol producers and corn growers. Biodiesel and renewable diesel firms face a similar situation. Without the EPA's RINs and quota driven demand, they simply aren't profitable. By comparison the current Geismar cash margin is a loss of $1.35 per gallon before $2.55 per gallon from RINs and $1 subsidy. Cellulosic biofuels haven't even left the gate yet, and ending the EPA's RFS2 program would almost certainly kill this entire industry. Even with all the government's support, there still is no material production. The cost structure is also far from being competitive. To highlight the dangers ethanol faces with the possible repeal or weakening of RFS2, one only needs to look at the impact the EPA's RFS programs have had on the industry. The RFS1 was signed into law in 2005, and RFS2 was signed into law in 2009. 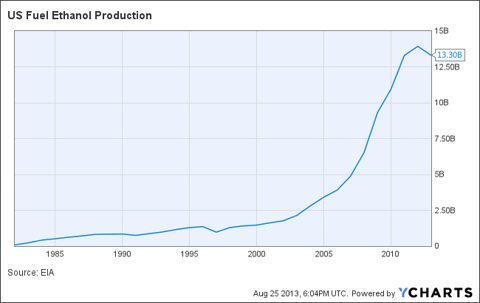 Ethanol production exploded over that time period increasing from about 4 billion gallons to over 13 billion gallons today. Without the RFS2 supporting ethanol production with the RINs and quotas, the revenues generated from a gallon of ethanol would almost certainly fall below production costs. Repeal or weakening of the RFS2 would likely impact the earnings of ethanol producers, many of which would almost certainly go bankrupt. Firms like Pacific Ethanol (NASDAQ:PEIX), BioFuel Energy (NASDAQ:BIOF), Green Plains Renewable Energy (NASDAQ:GPRE) and REX American Resources (NYSE:REX) would almost certainly suffer. Other renewable fuel companies like Renewable Energy Group (NASDAQ:REGI) and KiOR (NASDAQ:KIOR) would have to fight to survive. The collapse in corn prices would also impact the earnings of farm equipment manufacturers like Deere (NYSE:DE), AGCO (NYSE:AGCO) and Caterpillar (NYSE:CAT). Corn seed producers like Monsanto (NYSE:MON) and DuPont (DD) would also see revenues fall. Worst of all farm prices would likely collapse, some having tripled in price over just the last few years. DAN LINDSTROM remembers looking at a piece of Nebraska farmland six or seven years ago that cost $3,300 an acre...A few weeks ago, Mr. Lindstrom said similar land sold for nearly $11,000 an acre..."Right now it's at auction as high as $12,000 an acre," he said of land to grow corn and soybeans in northwest Indiana. "A poor plot of land went for $8,000." To add fuel to the fire, the RFS2 doesn't even seem to be operating as intended. Fellow Seeking Alpha author Tristan R. Brown has written a series of articles on how the RIN mechanism simply doesn't seem to be functioning as intended, and in fact are hurting companies and investors. I doubt hurting companies and investors is a long-term winning strategy for the EPA and its supporters. I noticed a common theme throughout many of the presentations, however: uncertainty regarding RINs has only increased as RIN prices have. This has a number of important implications for investors in those sectors affected by RINs. First, biofuel fundamentals are no longer driving RIN prices...Based on what I heard at the RIN Academy, however, I'm no longer sure that RIN prices are even operating entirely as a function of consumption fundamentals. The facts are the EPA's RFS2 and RIN mechanism was designed by a bunch of Ivory Tower Central Planners, and the results described above are exactly what should have been expected. The Ivory Tower Einsteins have yet to figure out what works on paper rarely works in the real world, especially if you have no real world experience to draw upon when concocting your themes and schemes. Economies and markets don't fit nicely into test tubes, a fact the central planners simply choose to ignore...over and over and over again. Facts are these centrally planned programs almost always end badly, and if the EPA's RFS2 ends badly, it will be very bad for the biofuels and supporting industries. In conclusion; investors in green economy stocks, especially the biofuels, should watch the upcoming congressional hearings for clues as to any changes that may impact the EPA's RFS2. While I doubt any major changes will be made immediately, the main reason for the GOP hearings is to weaken support for climate gate legislation as they head into an election year. If the GOP captures the Senate and strengthens their hold on the House, they will be in a much stronger position to fight any pending legislation. President Obama would almost certainly veto any GOP legislation, and a veto proof GOP majority is unlikely, so I would expect the RFS2 to be safe at least until the next presidential election. If temperatures continue to flat line or even fall, the EPA's RFS2 program will almost certainly be a hot political topic in the presidential campaigns, and if energy prices aren't any lower than when president Obama took office, the green economy stocks may be in for an extreme cold spell. Disclaimer: This article is not an investment recommendation. Any analysis presented in this article is illustrative in nature, is based on an incomplete set of information and has limitations to its accuracy, and is not meant to be relied upon for investment decisions. Please consult a qualified investment advisor. The information upon which this material is based was obtained from sources believed to be reliable, but has not been independently verified. Therefore, the author cannot guarantee its accuracy. Any opinions or estimates constitute the author's best judgment as of the date of publication, and are subject to change without notice.